Those who have historically contributed the least to the greenhouse gas (GHG) emissions warming our planet often stand to be most affected by the localized adverse impacts that these will have on community health and quality of life. These localized impacts, ranging from extreme heat to rising sea levels, will disproportionately affect vulnerable populations such as the elderly, renters, low-income residents, those with pre-existing medical conditions, and those without health or home insurance. Yet the same communities considered most vulnerable to climate change also contain culturally based practices and skills and a wealth of knowledge about how to creatively marshal social networks to augment limited resources to weather hard times. For example, Vietnamese immigrants in New Orleans were able to tap into and adapt traditional fishing practices to cope with food shortages in the wake of Hurricane Katrina. The Pacific Institute Resilient Roots Project works to connect Oakland, Calif. residents to the resources and capacity they need to take individual and collective action to build their resiliency to local climate impacts and to engage in climate action plan implementation efforts to better prepare and protect their communities from these impacts. We partner with community-based organizations and coalitions to conduct action research and popular education that supports community-led efforts to build resilience and advances adaptation planning priorities identified by residents of vulnerable communities. Since 2010 the Pacific Institute has partnered with the Oakland Climate Action Coalition (OCAC) to assess local climate change impacts, vulnerability, and adaptation options and develop actionable tools to engage impacted communities in climate adaptation planning efforts with a focus on implementation of the City of Oakland’s Energy and Climate Action Plan. With OCAC’s Resilience and Adaptation Committee, we are developing community education materials on flooding, poor air quality, and other local climate change impacts, as well as popular education activities to engage residents in building resilience to these impacts in their communities. 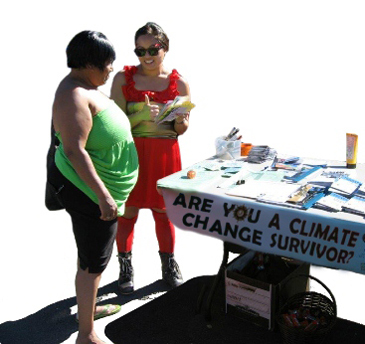 We are currently compiling a resilience education workbook featuring Climate Change Survivor, an interactive game for residents to learn more about what they can do to better prepare and protect themselves from climate change impacts. For more information about our Resilient Roots Project, please contact Catalina Garzón, Program Director, at cgarzon (at) pacinst.org. It’s My Drought! And Yours. Face it.